Hatsuzumi Shincha is one of the first picked spring teas in Shizuoka Prefecture. In the Japanese language, "hatsu" means first and "zumi" comes from the verb tsumu, meaning "to pick" -- hence "first-picked" tea. Hatsuzumi Shincha's taste is of a slight pleasant bitterness on the fresh sweet note. 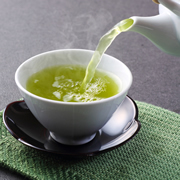 Both everyday tea drinkers and connoisseurs will be satisfied with this outstanding Shizuoka green tea. It is highly worthy of meaningful gift giving. Brewing instructions are not printed on Consumer (Bulk) packages. Please see the How To Brew page for brewing instructions. Hatsuzumi Shincha brews exactly like Sencha.